According to this press release, Belkin will be joining a small but growing club of vendors who offer wireless routers with 802.11ac. The latest Wi-Fi standard, 802.11ac operates on 2.4GHz and 5GHz bands simultaneously to deliver higher speeds than current alternatives, like 802.11n. The company plans to introduce two models by the end of the month: the AC1000 which will weigh in at $139.99 and the higher-end AC1200 with an MSRP of $159.99. According to Belkin, the primary difference between the two appears to be the AC1200 features speeds up to 1166Mbps while the AC1000 tops out at 996Mbps. Other features listed seem to be the typical, standard fare. As a tech enthusiast though, I have to admit I'm puzzled by these numbers. These figures come straight from Belkin, but I'm honestly not sure how the math adds up. Maybe some readers can help me here. 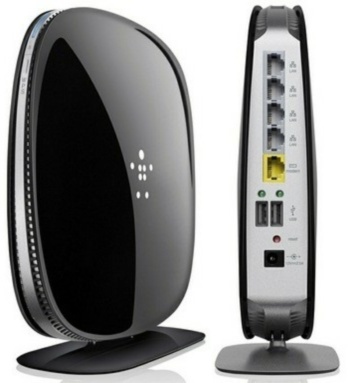 Belkin claims the AC1200 delivers 300Mbps (2.4GHz) and 867Mbps (5GHz), giving the company its 1166Mbps figure. Keep in mind that 802.11ac is limited to 8 spatial streams and can operate on 20MHz, 40MHz and 80MHz channels. So, how does Belkin get 300Mbps? I can't help but think this is a mistake, since 802.11ac delivers 433.3Mbps per stream with 80MHz channels. Even if we narrow the channels to say, 40MHz or 20MHz, we still can't get an even 300Mbps. Likewise with the AC1000 -- it supposedly delivers 300Mbps (2.4GHz) + 665Mbps (5GHz) -- but where does that 300Mbps figure come from? I think it is worth pointing out that 300Mbps is a common number for 802.11n, a standard which provides 150Mbps per stream and a maximum of four streams. It's probably just a mix up. It's also interesting to note that no other manufacturers offer these same exact speeds on their 802.11ac products. What we have been seeing on 802.11ac routers though, are 3 x 433.3Mbps streams, as Buffalo, Netgear and others offer. That's 1.3Gbps, or just 867Mbps with two streams. Additionally, those figures are in line with Broadcom 802.11ac chips we've seen -- chips that are likely to be powering the AC1000 and AC1200. On Belkin's website, they also list both routers as having gigabit LAN ports on this chart. However, on that very same chart, "Gigabit Ports" is not checked as a feature for the AC1000. Fascinating.